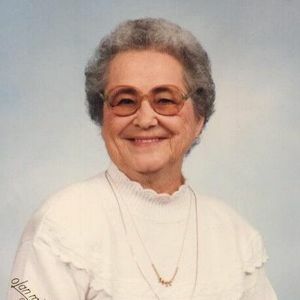 Denise Marie Schilling passed away on Wednesday, April 10, 2019, in Hammond, Louisiana at the age of 95. She was born on Monday, December 10, 1923 in Morganza, Louisiana. She was a resident of Ponchatoula, Louisiana. Denise is survived by her husband, Frank P. Schilling, Sr.; sons, Frank P. Schilling, Jr. and his wife Belita, Louis Schilling and his wife Nita, Joseph Schilling and his wife Charlene, Robert Schilling and his wife Kathy, Terry Schilling and his wife Yvette; daughters, Joyce Tregre and her husband Louie, Jean Williams and her late husband, Sammie, Patricia Rodriguez and her husband Richard, Betty Dickens and her husband Jim; 25 grandchildren, and many great and great-great grandchildren. She was preceded in death by her parents, Louis J. Dugas and Alice Babin Dugas. Relatives and friends are invited to attend the Visitation on Thursday, April 11, 2019, 6:00 pm until 9:00 pm at Harry McKneely & Son Funeral Home in Hammond and continue on Friday, April 12, 2019 at St. Thomas Catholic Church, Highway 22, Springfield, Louisiana 70462, from 9:00 am until the Funeral Mass begins at 11:00 am. Interment will follow at Wadesboro Catholic Cemetery in Ponchatoula, Louisiana. My heart goes out to all the family and friends. My thoughts and prayers are with you and I pray Aunt Denise rest in peace. To the Schilling family. I am so sorry for the loss of your beloved Denise. You all have been one of my all time favorite families, and Cousin Denise was a big part of that. May God bless you as you come together at this precious time. My thoughts and prayers are with you in this time of despair. You have my deepest sympathy. God Bless you and give you strength.